Caleb Laieski is a 16 year old advocate for LGBT (lesbian, gay, bisexual, transgender) youth. Last year Caleb was bullied and harassed at his high school in Arizona, which resulted in him getting his school and district to update its anti-discrimination policy and include protection for LGBT students in the student handbook. 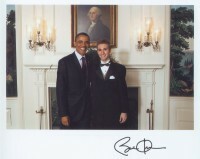 After being invited to attend the White House Conference on Bullying in March 2011, Caleb returned to D.C. to meet with nearly 200 members of Congress and congressional offices to advocate for the Student Non-Discrimination Act currently pending before Congress. He also had the opportunity to meet with President Obama as well as Vice President Biden. You can follow Caleb on Twitter or his organization Gays and Lesbians United Against Discrimination on Facebook. You can also follow his current work on Linkedin.com. Hear what Caleb has to say as a bullied youth turned LGBT advocate who is not afraid to use his voice. Natalie is the co-author of 'Every Vote Matters: the Power of Your Voice, from Student Elections to the Supreme Court' (Free Spirit Publishing), which she wrote with her father Judge Tom. Prior to joining the AsktheJudge.info team, Natalie worked as a criminal defense attorney. She is passionate about helping youth find their voice and becoming engaged members of their community. She also volunteers for a case involving climate change litigation. It sounds like Caleb is a trailblazer for young people in the LGBT community. I’m glad that Caleb’s voice is being heard, but it’s important to keep in mind that LGBT’s are not the only groups of young people who are singled out for bullying…the problem is much, much larger than that.